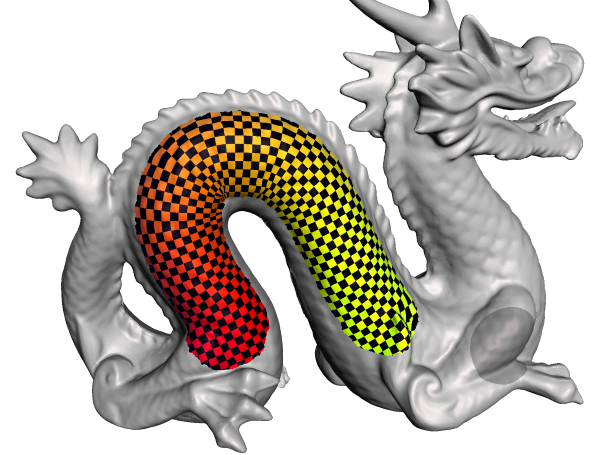 We present a novel algorithm for generating a planar parameterization of the region surrounding a curve embedded in a 3D surface, which we call a stroke parameterization. The technique, which extends the well-known Discrete Exponential Map [SGW06], uses the same basic geometric transformations and hence is both efficient and easy-to-implement. We also handle self-intersecting curves, for which a 1-1 map between the original surface and the plane is not possible. Stroke parameterizations provide an ideal coordinate space for solving a variety of computer graphics problems. We present applications including tiling texture and displacement along 3D brush strokes, procedural texturing along 3D paths, and user-guided crease extraction.